Today, Dancing idol of Ganesha is mainly worshiped during 10-day Ganesh Chaturthi festival. It is also known as Nataraja Form of Ganesh. This pose of Ganapati is widely seen in paintings and sculptures. But Dancing Ganesha sculptures were widely used in ancient Hindu temples. In this form, Ganesha is musician and blesses devotees with skill and efficiency in music, dance and arts. Dancing Ganesha adorn the walls and pillars of numerous Hindu temples. 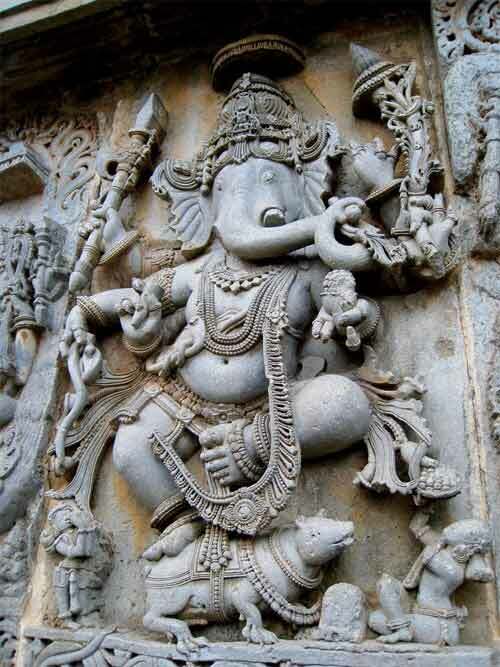 The 12th century AD Nritya Ganesha murti at Hoysaleswara temple at Halebid in Karnataka is a very famous sculpture. At the famous Mukteshwar temple at Bhubaneswar in Odisha, dancing Ganesha has two hands raised above the head and the murti is holding a ferocious snake. As per some beliefs, this pose symbolizes positive energy. It is also associated with creation and destruction. Dancing Ganesha should have eight hands, seven of them hold basa, ankusha, sweet, axe, danda, valaya (quoit) and anguliya. One hand remains freely hanging so as to be helpful to the various movement of the dance. The color of the body of the dancing Ganesha is golden yellow. To show that it is a dancing figure, in ancient times the figure was sculpted with the left leg slightly bent, resting on the padmasana, and the right leg also bent and held up in the air. Eight hands dancing form of Ganesha is also associated with Tantric puja. Those who practice black magic worship eight-armed dancing Ganesha. Miniature sculptures of Dancing Ganesha are available today for sale. However, they are not worshipped in homes. In homes, generally the sitting form of Ganapati is worshipped. It must be noted here that there is also a Nritya Ganapati among the 32 forms of Ganesha worshipped.